A guest of the royals. 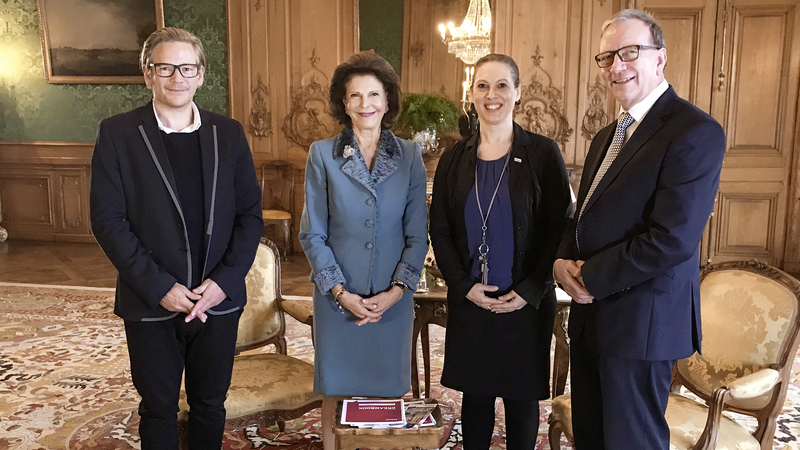 Schindler Parent interviews Queen Silvia of Sweden. Schindler ParentAktuellesPresseA guest of the Swedish royal family. Joint film production by etikette and Schindler Parent for the Mentor Foundation. Her Majesty Queen Silvia of Sweden founded the Mentor Foundation in 1994 in collaboration with the WHO. From the very beginning, the focus was on empowering young people and motivating them, giving them access to education and future prospects. Sybille Perez manages the foundation’s work in Germany. Together with her and film producer Oliver Helms, our Managing Director, Michael Meier, headed to the Kungliga slottet, the Royal Palace. We conducted an in-person interview with patron Queen Silvia for a film about the German Mentor team. Michael Meier was of course happy to do this, as it was a great honour and a change from his usual work. You could really sense the Queen’s interest in topical issues and her passion for helping young people in the relaxed atmosphere. This meant that the results are exciting. It’s fair to say the German team came back to Lake Constance having found a great deal of inspiration.